Grilled Blooming Onion makes a great appetizer and it's just as flavorful as in the restaurant; healthier too. Prepare your onions by cutting 1/2 inch off the stem end, then peel all the skin off. Place onion cut side down, then 1/2 inch from the Root make a downward cut straight to your cutting board. Continue slicing evenly between sections until you have 12 evenly spaced cuts. Preheat grill to 325-350 degrees. Turn the onion over and separate the petals. Dip the onion into the milk/egg mixture and then coat it liberally with the Blooming Onion Rub mixture. 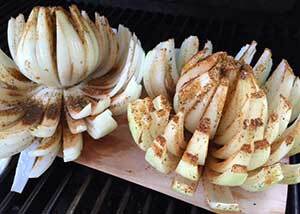 Sprinkle your onions with the Blooming Onion Rub Ingredients exclude 1 cup flour. Finish by generously drizzling olive oil all over onion or use oil sprayer. Place on plank, if using. Have grill heated on low (325-350) and cook until petals pull off easily and our soft and tender. About 1 hour. Garnish with fresh basil and parsley. Serve hot, and with dipping sauce.